In an effort to centralize all of our blogs we will be moving all posts to the InSTEDD site. Please continue to follow our blog at this new address. Hans Rosling at the InSTEDD iLab! Just a quick note to mention that Hans Rosling, one of the most interesting medical statisticians alive, came by the InSTEDD Innovation Lab on the day of our Buddhist Blessing Ceremony to offer a few thoughts about Cambodia to our iLab staff. Hans, a medical doctor out of the Karolinska Institute in Sweden, has developed a set of tools for visualizing data in a simple, intuitive, and informative way, and he ruptures a lot of myths in his moving bubble diagrams. His work on HIV, on investments in the developing world, the relationships between education and child health, and more, has affected thinking - and policy - at national and international levels. He's a phenomenal teacher, and to have him spend two hours at our iLab, talking about Cambodia to our Cambodian staff (and lots of visitors for the occasion), was a wonderful stroke of good fortune. You'll get the idea below that his work with his software, Gapminders, visualizing data from statistical databases at WHO, the World Bank, and elsewhere, was engaging, thought-provoking, and a real kick-start to the Dynamic Resource Mapping capabilities we're just now moving out into the world (see the Dynamic Resource Mapping blog below). Great timing for us, explaining why REALLY knowing what you have out there is critically important. To get a flavor of his hours spent with us, I recommend any one of the talks that Hans has given at TED. You can see his most recent, at TEDIndia last summer, here. Other TED talks include a little sword-swallowing. He's an interesting man. Thanks, Hans. It was a terrific day. The second half of January was a blur of collaborative activity around the earthquake in Haiti. As many of our readers know, InSTEDD, with a collection of competent, attentive, and collegial partners around the world, had a team on the ground at the Port au Prince airfield within about 72 hours after the quake. We accomplished some significant and continuing good and I’ll discuss that elsewhere. February, though, began in Bangkok. Each year the Prince Mahidol Award Conference selects one or more global leaders in public health for recognition of their lifetime achievements. The ceremony, in Thailand, serves as a useful opportunity to hold one of the better Public Health conferences of the year. More than 1,000 attendees from dozens of countries converge on Bangkok for three days of presentations and conversations, and this year InSTEDD had a very strong presence. The week began with a separate Press Conference led by the Thai Health Promotions Foundation. They were describing our new SMS shortcode for GeoChat-based reporting and alerting everywhere in Thailand, and included recognition of our implementing partners in Thailand (Change Fusion and OpenDream), our most prominent funder in the Mekong (Google.org) and our new relationship with a Thai communications company (DTAC). We've spent a lively and interesting few months shaping a business relationship with DTAC around SMS messaging in humanitarian support. In January we all found some common ground and implemented a good first step at lowering the financial thresholds for disease reporting and outbreak surveillance. Our goal is to provide a free SMS shortcode for GeoChat use everywhere in Thailand and we’re getting there. We’re now confident that we can continue to refine our new relationship into a model for other areas of the developing world that need a reporting and alerting capability for emergencies. Based on the later media coverage it was apparently a very successful press conference, conducted mostly in Thai, with DTAC explaining what they've done with our partnerships, and Change Fusion demonstrating a few of the new capabilities in GeoCha t. I’ve just heard this week that InSTEDD and our partners made it to the front page of the newspapers in Bangkok, and I’d already seen video from television broadcasts of the event. Although it’s all in Thai, I’ll share them here at Thai TV Video 1 and Thai TV Video 2. A day or so later Channe Suy, InSTEDD’s Product Manager from our Innovation Lab in Phnom Penh, presented to a large Prince Mahidol audience our ideas around InSTEDD’s Innovation Lab concept, and specifically why we have one in Cambodia. She touched on the value of the open and shared space for innovative technical work that we’ve provided since 2008, and she spent some time describing our focus on capacity building, local teams working in local languages, interoperability, integration with existing workflow and tools, and how InSTEDD works toward an intersection of grassroots needs and national priorities. Channe gave a terrific talk, well delivered and well received, and I heard great comments about it throughout the rest of the conference. 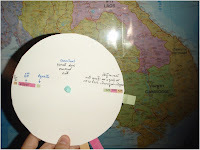 One topic Channe addressed was our Magic Wheel – a physical object – that helps minimally-literate Community Health Workers report disease outbreaks in a consistent, reproducible, error-correcting fashion using a tool we’ve designed that looks a little like a circular slide rule. It received rave reviews for its simplicity, clever, intuitive, and robust mathematical structure, and its adaptability across languages. We'll talk more about it when the field testing is a little further along. I, too, spoke at the conference. My topic was policy and technology in Health Information Systems and I spoke about the need for better guidelines around cloud computing, the challenges between transparency (public safety) and privacy (personal safety) in an emergency, a little about interoperability (as always...), code-escrows, telco contracts, capacity building, and deliberate exit strategies that leave new capabilities properly in the hands of responsible agencies. I was drawing on our work in Haiti and elsewhere (with photographs for illustration), and it was probably a bit much for a 20-minute talk, but you can judge for yourself here. 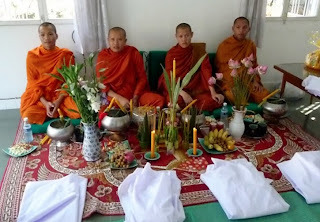 A few days later in Phnom Penh, we were all able to reconnect in the iLab, getting together as the largest single gathering of the InSTEDD team in a year, and sharing in a gorgeous and moving Buddhist Blessing Ceremony for our place and our work. It was a nice moment in the history of the lab and I think it bodes very well for the coming year. We had several days in Cambodia, and it was great to see the new faces as people join us, and to watch how well the iLab has moved forward to address concrete problems identified by local staff. It’s a terrific model for developing a local brain trust within a neutral space, addressing local cross-sectoral problems, and it’s getting better constantly as we learn. We intend to adapt the iLab idea to new sites and new needs over the coming years, and we’re watching now for locations where this capacity building might be most useful. Suggestions are welcome! Drop a note to me at Rasmussen@InSTEDD.org or, if you're really excited about a possibility, call me on my cell at +1-360-621-3592. 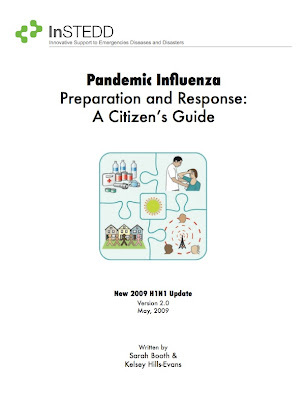 The new Pandemic Influenza Citizen's Guide, edited by Sarah Booth and Kelsey Hills-Evans to incorporate information around the recent H1N1 (Swine) flu outbreak, is now posted here.